Colors are just as shown. Fabric is decent - could use a bit softening, but hoping a few washes will take care of that. Pillows are good quality. Overall, very cute set. Fiercely fun, the Urban Habitat Kids Aaron Duvet Cover Set provides an adventurous update to your bedroom. 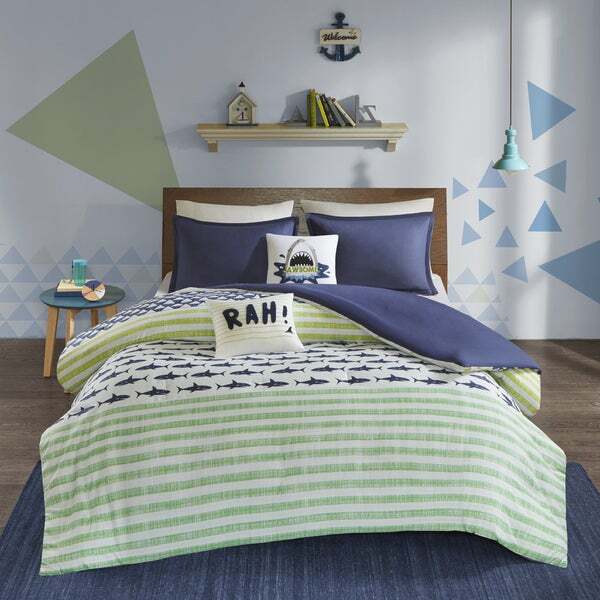 The 100-percent cotton duvet cover sports sharks and stripes in navy and green colors that pop on the light grey background. Coordinating shams, in corresponding colors, pair well with the duvet cover to complete the look. A solid navy reverse adds a bold splash of color, while two decorative pillows with embroidery provide the finishing touches to the bedding set. One pillow features a plush applique shark with the typography, 'Jawsome' and the other screams 'Rah.' in a style that complements the top of the bed. Machine washable for easy care, this awesome duvet cover set is sure to make a splash in your bedroom. Comforter insert not included. Looks great! Exactly as pictured!